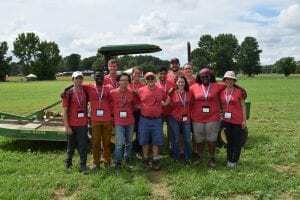 2018 Cornell Weed Science Team Members: Front Row- from left to right: Robert Galbraith, Stephen Owusu, Liang Cheng, Toni DiTommaso (faculty mentor), Amanda Sudlovsky, Aleah Butler-Jones, Gia Yao. Back row- from left to right: Matthew Spoth, Maria Gannett, Danilo Pivaral, Eugene Law, Jonathan Berlingeri. 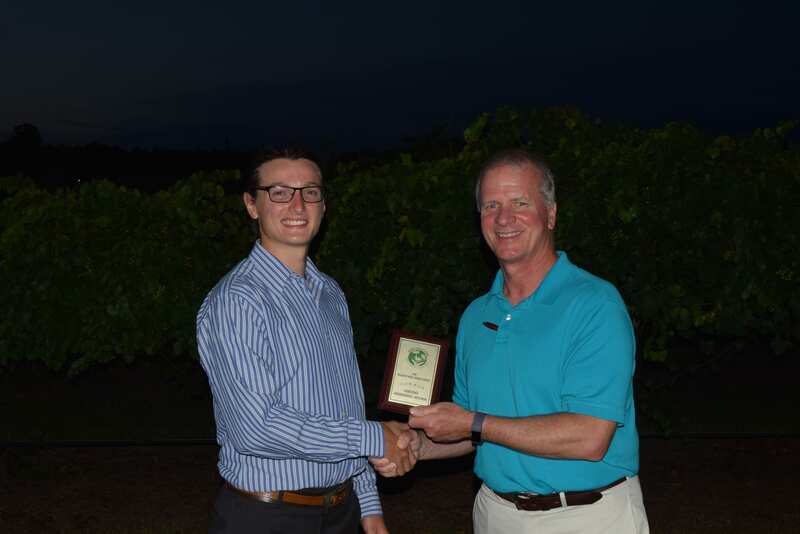 Once again this year, Cornell students did a masterful job at the Northeastern Collegiate Weed Contest held on July 24, 2018 at the BASF Research facility in Pine Level, North Carolina. Teams competing included Clemson University, Cornell University, North Carolina State University, Ohio State University, Pennsylvania State University, Rutgers University, Virginia Tech, and the University of Guelph — which traditionally dominates the undergraduate category of the competition. Students compete in four categories: weed identification, sprayer calculation and calibration, herbicide identification, and farmer problems. Two of our Cornell undergraduate students (Aleah Butler-Jones – 2nd place) and Jonathan Berlingeri – 3rd place) placed in the top three medal slots in the individual undergraduate category, again denying Guelph of the traditional medal sweep of this category. Congratulations Aleah and Jonathan and thank you to SIPS for providing support! Aleah Butler-Jones receiving 2nd place undergraduate individual award from NEWSS President Carroll Moseley. 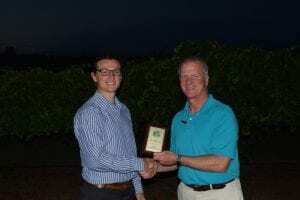 Jonathan Berlingeri receiving 3rd place undergraduate individual award from NEWSS President Carroll Moseley. Interested in competing in a future year? The four different areas of the competition are structured around the following parameters. Weed identification: Students are typically given a list of 120 weed species to know (from seed to mature plant) some 4 months ahead of the contest and in the contest they will be asked to identify 25 of the species (5 of which will be seeds). For five of the 25 species, they will need to write down the scientific name of the species — common names are OK for the other 20 species. For each of the 25 species, students also need to choose a correct biology/ecology related multiple choice answer for that species. The students are provided live plants for the contest. Sprayer calculation and calibration. For the sprayer calculation part of this contest category students are given 30 minutes to answer (written) a set of sprayer related problem sets that requires calculations and good knowledge of sprayer technology. The second component is a team hands-on event where the students need to properly calibrate a hand-held 4 nozzle sprayer and apply the proper amount of product (water in this case) based on a previously calculated spray volume and speed. They also have to select the proper nozzles and screen meshes based on the calculated spray rate and using a Teejet Manual. Herbicide Identification: Considered the most difficult component of the contest, participants have to identify the correct 10 herbicides out of a list of 30 herbicides that were sprayed on test field plots. The students have to learn both what the specific herbicide symptomology looks like on affected plants as well as the selectivity or lack thereof of the herbicide based on 10 crops and 10 weeds that are in each plot. The students are also expected to know the family of the 10 herbicides they select as well their modes of action and site of action. Scoring 50% on this part of the contest is considered good! Farmer Problems: In this interesting and fun part of the contest, students role play and need to solve a real crop/plant issue that may be related to herbicide use/misuse but often is not. The students are told at the outset what role they will take on (e.g. extension educator, industry representative) and what the general issue/problem they will be dealing with (e.g. why are some of this organic farmer’s tomatoes dying?). Volunteers at the contest (e.g. 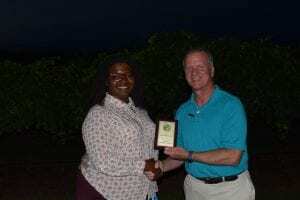 faculty, extension educators, industry reps) take on the role of the organic farmer and there is also a judge that keeps score of how well the student is doing in terms of asking the proper questions to arrive at solving what the issue may be. Students can score well even if they do not completely solve the problem as long as they ask relevant questions that eliminate other possibilities (e.g. environmental factors, plant diseases, insect/mammal damage, improperly cleaning out a sprayer tank, etc..). The students need to provide a recommendation to the farmer or other stakeholder for the current year as well as next year. These farmer problems are done at appropriately set up field locations on the site where the contest is held (e.g. research farm) so that it feels like the “real” thing…. Each student has to solve two farmer problems.